Opening night of the 2014 racing season at Oxford Plains Speedway in Oxford, Maine saw a great crowd and some awesome racing as the track kicked open its 65th season featuring the Budweiser Oxford Championship Series on Norway Savings Bank night. 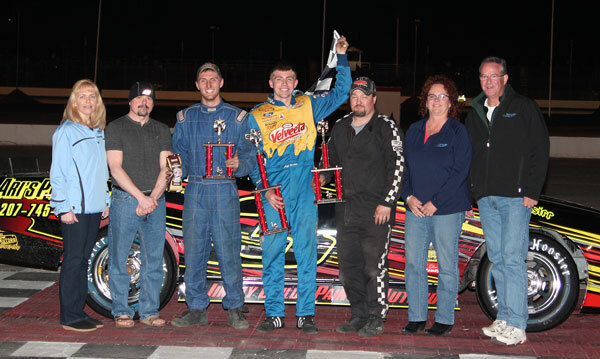 Winners on the night included TJ Brackett, Josh “ The Wild Child” Childs, and Troy Jordan. A full field of twenty-eight Budweiser Pro Late Models rolled to the starting grid with the father and son team of TJ and Tim Brackett comprising the front row. When the green flag dropped TJ was off and flying, with his father Tim, Gary Chaisson and Trevor Sanborn in chase. TJ Brackett starting running into lap traffic around the fifteenth circuit, but he masterfully worked his way around the slower cars until the first caution flew at the half way point. A great battle was developing for the second through fifth positions as Chaisson, Shawn Martin, Kyle Desouza, and Tommy Ricker continued to dice back and forth allowing TJ Brackett to extend his lead. Four cautions dotted the remainder of the event, and each time TJ Brackett pulled away from the field and cruised to the opening night victory. Kyle Desouza battled his way by Shawn Martin with two laps remaining to pick up the second spot ahead of Martin, Chris Coolidge, and Tommy Ricker. Sixth through tenth spots went to Chaisson, Jeremy Davis, Shane Greene, Scott Moore, and Vanna Brackett. Heat checkers flew for TJ Brackett, Tim Brackett and Chaisson. The “Wild Child” Josh Childs dominated the opening night main event in the Allen’s Coffee Flavored Brandy Street Stock 30 lap main event, but he had to hold off a last lap bonsai move by Zack Emerson in lapped traffic to score the popular win. Emerson pulled up to the passenger door coming to the stripe, but his fine effort fell a little short. Spencer Morse was third, followed by Ryan Hewins and David Whittier. Childs and Whittier won their respective qualifiers. The Ripley and Fletcher Ford Outlaw Sportsman saw Troy Jordan dust the field as he left Corey Morgan, Jerry Freve, Michel Rand and Josh Toothaker well behind. Corey Morgan and Jordan carried the checkered flag in the preliminary races. Oxford Plains Speedway will be back in action this coming Friday night as the Maine Highway Safety program sponsors Motorcycle Highway Safety night. Post time is 7:30pm. For more information on Oxford Plains Speedway call the hotline at 207-539-8865. Oxford Plains Speedway is located on Route 26 in Oxford, Maine.